Northants head coach David Ripley has revealed the county have missed out on the signing of Nottinghamshire’s Brett Hutton. Ripley had earmarked medium-fast bowler Hutton as a man to help fill the void left by David Willey, who is moving to Yorkshire. But the 22-year-old opted to remain at Trent Bridge after his playing time at the County Championship Division One club increased. Hutton has eight first-class matches under his belt, taking 24 wickets and notching 270 runs. But he will not be heading to Northants at the conclusion of this campaign. “We did put 28 days’ notice on Ben Hutton but that coincided with him playing more cricket at Notts so he’s decided to stay where he is,” Ripley said. “Other than him, we’re waiting to sort out our own staff and we’ll see where we go from there. It’s a bit sleepy because we’re still waiting for final budget figures. 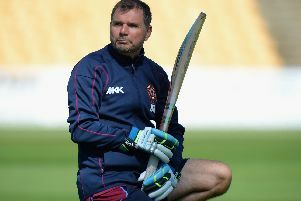 Ripley says Northants are not looking to expand their squad size for next season. But he knows they must replace England all-rounder Willey. “The main thing we need to replace from David is a seam bowler because we had six seam bowlers at the start of the season of which David was one,” Ripley said. “We’ve need someone who can bowl some of our overs and you’re not going to get many David Willeys. “It’s not as though we’ve got David’s salary to go out and spend, we’ve got to make a slight adjustment to the budget and we’ve got to do the best we can. “We’re looking for value for money, which is important given where we are. “With a small squad we probably need people who can feature in all formats.